Infiltrating osteoporotic cancellous bone with bone cement (vertebroplasty) is a novel surgical procedure to stabilize and prevent osteoporotic vertebral fractures. Short-term clinical and biomechanical results are encouraging; however, so far no reports on long-term results have been published. Our clinical observations suggest that vertebroplasty may induce subsequent fractures in the vertebrae adjacent to the ones augmented. At this point, there is only a limited understanding of what causes these fractures. We have previously hypothesized that adjacent fractures may result from a shift in stiffness and load following rigid augmentation. The purpose of this study is to determine the load shift in a lumbar motion segment following vertebroplasty. A finite-element (FE) model of a lumbar motion segment (L4-L5) was used to quantify and compare the pre- and post-augmentation stiffness and loading (load shift) of the intervertebral (IV) disc adjacent to the augmented vertebra in response to quasi-static compression. 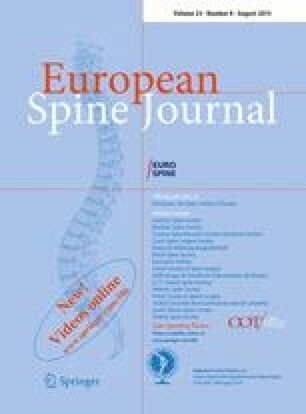 The results showed that the rigid cement augmentation underneath the endplates acted as an upright pillar that severely reduced the inward bulge of the endplates of the augmented vertebra. The bulge of the augmented endplate was reduced to 7% of its value before the augmentation, resulting in a stiffening of the IV joint by approximately 17%, and of the whole motion segment by approximately 11%. The IV pressure accordingly increased by approximately 19%, and the inward bulge of the endplate adjacent to the one augmented (L4 inferior) increased considerably, by approximately 17%. This increase of up to 17% in the inward bulge of the endplate adjacent to the one augmented may be the cause of the adjacent fractures. This work was supported by the Canadian Institute of Health Research (CIHR) grant no. MOP 57835.